The Shimano XT PD-M8040's are a super lightweight platform pedal designed for aggressive trail riding. Featuring 10 pins per side, the M8040 offers secure pedaling in even the most difficult terrain. Available in two different sizes, the platform sizes have been optimized for superior grip and comfort. Inside, Shimano's sealed cartridge bearings offer reliable, smooth rolling. The Shimano XT PD-M8040 is available in Small/Medium (EU shoe size 36-43), and Medium/Large (EU shoe size 43-48). 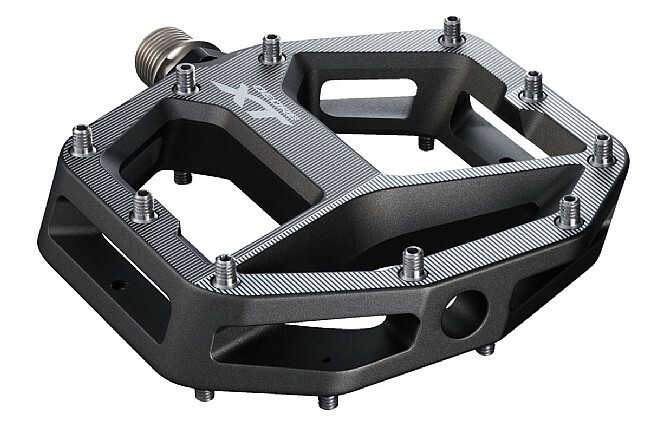 Lightweight flat pedal optimized for trail riding. 10 pins on each size. 2 pin length options: long or short. 2 body size options, offering different Q-factors and size-optimized platforms. Average weights: SM - 469 grams, ML - 514 grams.